We would like to tell you about the benefits of building your projects in Jelastic cloud. 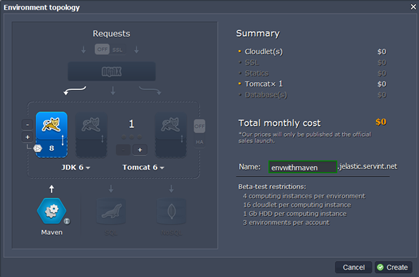 Now you can build applications in Jelastic cloud instead of building your projects locally and uploading WAR archives. It is faster and takes less traffic, you get the efficiency of the cloud and can keep using your computer without any extra load. 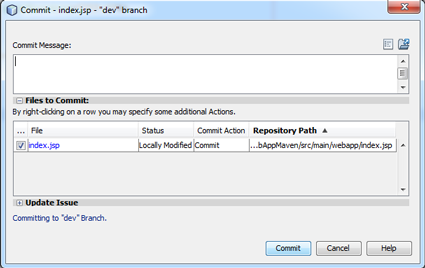 Jelastic can take application source code directly from your version control repositories (via Git or SVN protocol). Go to jelastic.com and sign up if you haven’t done it yet or log in with your Jelastic credentials by clicking the Sign In link on the page. Specify your resource limits in the environment constructor, pick an application server, select Maven as your building tool. Type your environment name, for example, envwithmaven, and click Create. Add your project to Maven. In the dialog, navigate to SVN tab, if you want to use Subversion as your revision control system. Specify your project name, Path to your project, Login and Password of your repository, name of your Environment, Context in which you will deploy your project, and click Add. 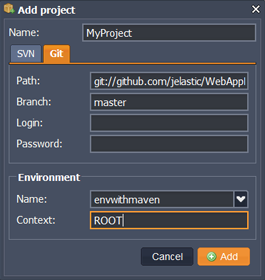 In the dialog, navigate to Git tab if you want to use Git as your revision control system. Specify your project name, Path to your project, Branch, Login and Password of your repository, name of your Environment, Context in which you will deploy your project, and click Add. Click Build button for the project. In a minute your building process will be successfully finished, and you can view the Maven log. Click Buid and deploy button for your project. You can view Maven deployment log to make sure everything’s okay. Your project must appear in the context that you have specified and in the Deployment Manager. Let’s now look how Maven is used in NetBeans to illustrate how SVN works. Run Netbeans (Eclipse, IntelliJ IDEA etc.) and choose Team tab on the task panel. 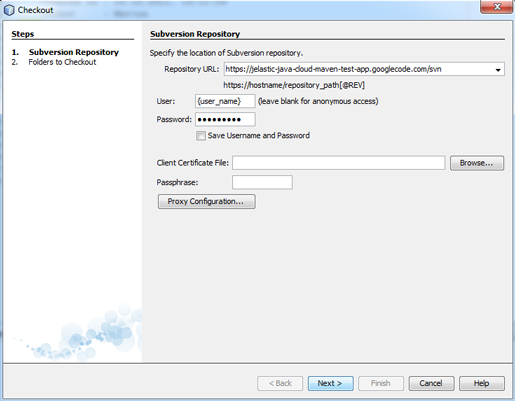 Specify the repository URL, user name and password, and click Next. 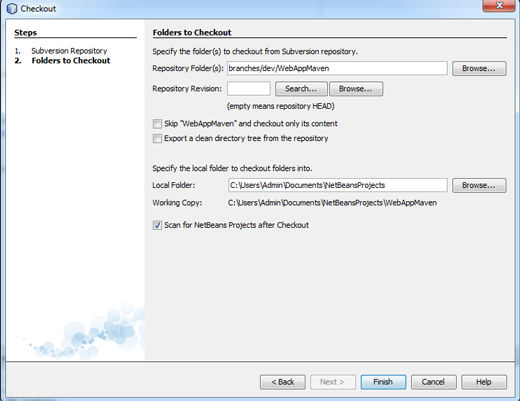 Specify the folder(s) to checkout from Subversion repository and click Finish. Once checkout is complete, your application will run in web browser. Make some modifications in your project and select Team_Subversion_Commit. Now you can run your application in web browser and see all revisions. 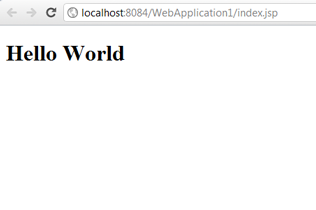 You can use our demo “Hello World” application at code.google.com. 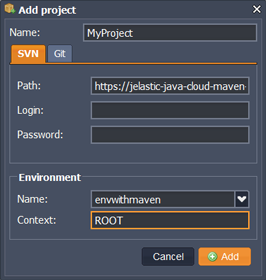 All you need is just navigate to http://code.google.com/p/jelastic-java-cloud-maven-test-app/wiki/InfoPage and get info from there for your Maven node in Jelastic.